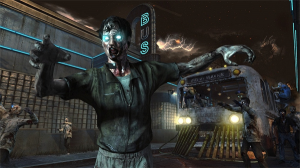 Call of Duty: Black Ops 2 Review | The Fighting 1:18th! Call of Duty is one of the most successful video game franchises in the world and every year around Veteran’s Day a new edition is released. 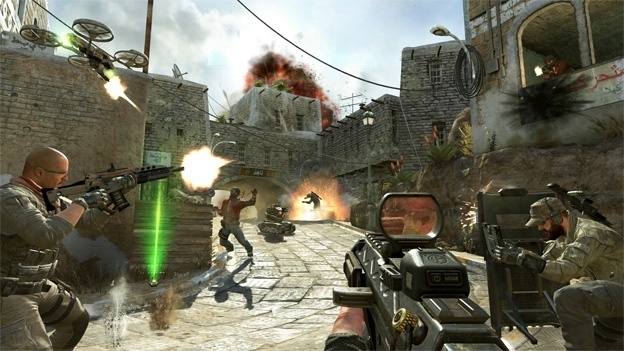 This year was the sequel to Treyarch’s Black Ops simply titled Black Ops 2. Will Call of Duty: Black Ops 2 deliver? I’ve personally preferred Infinity Ward’s CoD games more than Treyarch however I really enjoyed Black Ops and had high hopes for the sequel. The first thing that stands out in Black Ops 2 is the futuristic setting which many fans felt was a mistake. In reality the game is about 70% in the year 2025 and 30% in the 1980’s. The single player campaign has you shifting through time playing various characters including favorites from the first game like Sgt. Woods and Alex Mason. In the 2025 missions you play as Alex Mason’s son, David. The entire campaign has you fighting against a vengeful villain named Raul Menendez and his organization Cordis Die. Without spoiling too much, Menendez has interactions with Woods and A. Mason that place him on a violent vendetta that requires D. Mason and a 2025 Woods to resolve. I really enjoyed the 1980’s missions and I really wish that there were more of them. First of all I liked the characters more and despite it being 2 years since playing as Woods and Mason it felt like yesterday. 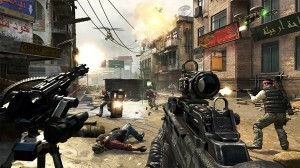 You complete missions in Angola, Afghanistan and Panama. The first mission in Angola is my favorite of the entire game.